In web browser,there are a couple of ways to open links/bookmarks in new tabs so that you do not worry about accidently browsing away from current page. 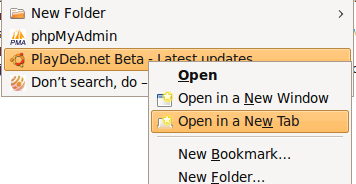 First way,as we know right click on the link or bookmark and select “Open in new tab” in pop up menu. If there’s a middle scroll wheel on your mouse,we can open new link/bookmark in new tab by middle-clicking on it. Or,just hold the Ctrl and single click on the link/bookmark.This also open links/bookmarks in new tabs. For Firefox,there an add-ons that we can just left click on all bookmarks and watch them open up in new tabs every time. 1 user responded in " Always make links/bookmarks open in new tabs "